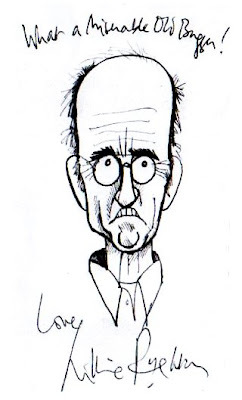 Willie Rushton's quite incredible characature of Michael de Larrabeiti. 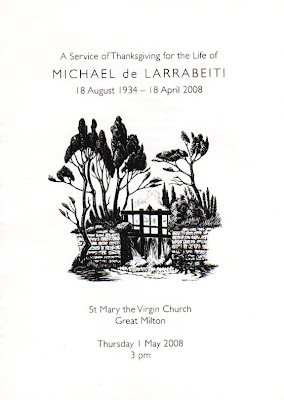 After Michael de Larrabeiti's funeral yesterday, I found myself saying to several people, "That was the best funeral I've ever been to" before stopping myself and wondering whether that was a terribly non-PC thing to say. But then I found myself inwardly smiling at the irony, because one thing Michael had no truck for was being PC. Michael's funeral was organised by his family and by Richard Balkwill, a consultant to the Publishers Licensing Society and senior lecturer in publishing studies at Oxford Brookes University. But apparently, Michael wrote the script for his funeral himself, and it showed. There was not a falsely reverential note during the entire day. He was a man fortunate enough to be surrounded by people who loved him but nevertheless told the truth about him; what could be worse than being reduced to a life where one is cosseted and surrounded by yes-men. Michael's funeral will go down in history for me as having the greatest proportion of genuine folk per square foot than almost any other congregation I've ever attended. No arse-licking, no PC nonsense, no the-sun-shone-out-of-his-backside. Everyone is human, and everyone has failings and qualities. All of us, at some time or another during our life, will do not only bad things, but dreadful things. All of us will perform acts of courage and kindness which astonish even ourselves, all of us will by loyal, all of us will be disloyal. All of us will hurt others, all of us will rescue others. All of us will be selflessly kind, all of us will be cruelly selfish. It's a part of being human. 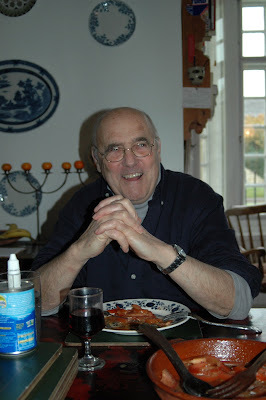 Michael de Larrabeiti at his home in Great Milton, Oxfordshire. Pic by Jude Calvert-Toulmin, 2007. But here is a quote by Proust which affected Michael deeply enough for him to include it in his masterpiece, Journal of a Sad Hermaphrodite, which is being republished by the avant garde and independent Tallis House on the 1st June 2008. …What one can say is that everything happens in our life as though we had entered upon it with a burden of obligations contracted in an anterior existence; there is nothing in the conditions of life on this earth to make us think ourselves obliged to be good, to be sensitive, even polite; nor for the artist to feel himself compelled to begin a passage twenty times over when the praise it evokes will matter little to the body devoured by worms…all these obligations…seem to belong to a different world, a world founded on goodness, on scruple, on sacrifice, a world entirely different from ours, and whence we come to be born on this earth, perhaps to return there and live under the rule of the unknown laws which we have obeyed here because we carried their principles within ourselves…those laws to which every deep intellectual labour draws us nearer, and which are invisible only…to fools. The last night was a riot and impossible to get those kids off stage; they sang their way through the songs again and again, marching up and down and round the auditorium. There were tears in my eyes and I was given a long round of applause: "Author, author," they shouted, bless 'em. It was the nearest I ever got to The West End. I spotted environmentalist, author, journalist and politician Stanley Johnson, with whom, along with Tim Severin, Michael repeated Marco Polo's original route in 1961, but didn't get a chance to talk to him which was a shame as I wanted to commiserate with him that his boy (Boris Johnson, running for Mayor of London - the votes are being counted as I type) got such a bashing in The Guardian's G2 yesterday. Whatever one may think of anyone, if you can't say something nice then don't say anything at all. Maybe that's why I'll never be a politician. On every film set I've worked on, I've always been the most interested in talking to the sparks and the chippies, the backstage crew, the facilitators whose work is hidden but without whom the stars wouldn't be able to shine. Michael was not only a "star author" in my eyes and in the eyes of many others (and, I am certain, even more in the future,) he was also a film technician; one of the crew, which is an interesting anomaly in itself. But backstage in his own life, one whose work was hidden, but who was clearly a luminary in her own right, was his wife Celia, who died before Michael, but whose memory ain't going anywhere soon. I deeply regret, having listened to people talk about her and having seen her photos (a stunning beauty, quite obviously both inside and out) not having had the chance to meet such a remarkable woman who has left such a deep impression on all who knew and loved her. By the end of the year I was stepping out with Celia, a tall slim good-looking girl from Devon. She had a graceful upright stance, a low pitched voice, golden hair and a figure to die for. Eighteen she was, that's all. I saw her that first time striding through the arched portal of Front Gate, the skirt swinging the way skirts swing, tense with life. 'She walked unaware of her own increasing beauty', unaware of her own elegance and the effect it had, 'a flower of good breeding.' She was as bright as a blue sky too, and I saw the talent, the resilience, the softness and all the love that made her what she was, and I was flooded by that love and knew that this was the girl I wanted to tie my life to, and I felt that love that only comes once and I took it into my heart and held it there. So this was why I had come to Dublin. Michael de Larrabeiti. From his memoirs, Spots of Time. Celia bore Michael three daughters, Phoebe, Aimée and Rose, and being a mother is without any shadow of a doubt, the most undervalued and difficult job on earth. A good mother will always be far more worthy of my respect than an esteemed professional in whatever occupation; that is not personal, that's just a fact. However besides the fruit of these human seeds, Michael's creative seeds will also continue to bear fruit for a long time to come. The creative energy Michael left behind him was equally as palpable as the grief, and that is a legacy in itself. The final song at the funeral was Al Bowlly's recording of Love is the Sweetest Thing, spontaneously accompanied by a group of Michael's oldest friends in the front row. Clip from L'Age D'Or by Luis Buñuel. Music, Love is the Sweetest Thing, lyrics and music by Ray Noble, sung by Al Bowlly. Many thanks to Michael's family, and especially to his great niece Sarah and her partner Adrian for thier kindness and hospitality yesterday; I feel as though I have made new friends there. And thank you to all Michael's family and friends for making me, a virtual stranger, and let's face it, basically just a gushing fan, so welcome. Best-selling author Jude Calvert-Toulmin interviews creative people. Please choose a user name if making comments. Jude Calvert-Toulmin is an author writing her seventh novel, The Vitamin Shot. You can find details of and links to buy her published novels at Fleur de Lys Publishing. She's also a passionate cook and has won Come Dine With Me and appeared on Come Dine With Me Champions.